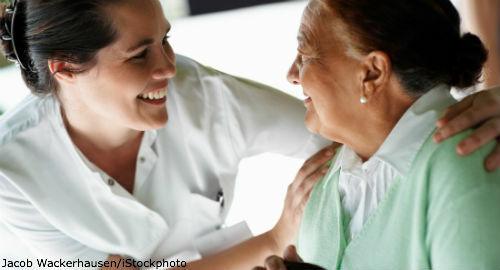 With their ability to provide treatment and manage chronic illnesses, nurse practitioners can aid patients with rheumatic diseases through their education and training. Nurse practitioners are registered nurses with additional education and training at the Master’s or doctorate level who can collaborate with rheumatologists to the benefit of a patient’s health. Rheumatology practices that employ advanced practice providers, such as nurse practitioners, have the ability to care for more patients. As a nurse practitioner at Gundersen Health System in Onalaska, Wis., Janet Bahr, MSN, APNP, RN-BC, performs many of the same tasks as rheumatologists. She collects patient histories, performs examinations and diagnoses, and designs care plans and discusses those plans with patients. While a rheumatologist sees new patients, Ms. Bahr sees patients for routine follow up. She also sees patients who are referred for osteoarthritis or fibromyalgia independently. “This frees up rheumatologists to see other patients,” she says. However, if a patient has complex medical issues, a rheumatologist may still need to see them or advise on their case. These patients may alternate between the nurse practitioner and rheumatologist during their appointments. “Patients usually value [when] they have us both involved in their care,” Ms. Bahr says. Patients seen by Linda Rodamaker, RN, MSN, ANP, an adult nurse practitioner at the University of Colorado in Aurora, Colo., typically alternate between seeing her with seeing with a rheumatologist. When she sees patients, multiple rheumatologists are available for her to consult with and to see patients as needed. Ms. Bahr excels in helping patients with chronic diseases, such as rheumatoid arthritis, manage their disease by developing a rapport with them. She gets to know patients well and establishes strong relationships with them. She also directs patients to community resources.